We congratulate Dr Caitlin Byrt on being awarded The Australian Society of Plant Scientists (ASPS) prestigious 2018 Peter Goldacre Award. Caitlin is a Postdoctoral Research Fellow in the University of Adelaide’s School of Agriculture, Food and Wine and the ARC Centre of Excellence in Plant Energy Biology at the Waite Research Precinct. Her research focuses on examining plant membrane transport and cell wall biology. 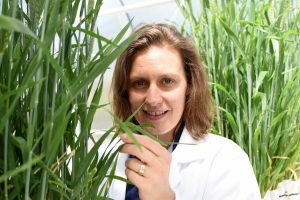 Catilin aims to produce research that identifies traits that influence cereal crop productively. We further congratulate her on receiving a Future Fellowship for the amount of $728,124 over four years for her innovative research that aims to increase our understanding on how plants regulate solute transport. When asked how she felt about receiving both these honours Caitlin said, “I am grateful for the support of our ARC Centre of Excellence in Plant Energy Biology Chief Investigators because their support and encouragement has made it possible to be in a position to be competitive in opportunities such applying for fellowships and the Australian Society of Plant Scientists Goldacre Award”. When asked about her hopes for her research Caitlin responded, “I’m looking forward to being able to focus on progressing research into understanding the physiological role of ion transporting aquaporins in plants. When plants experience salt or water-limitation stress, and when plant cells expand during growth, they must rapidly adjust water and ion transport across their membranes, and I’m keen to test how aquaporins may influence these processes. It is my hope that we can use information about the regulation of ion transporting aquaporins to engineer plants with enhanced tolerance to osmotic stress”.